I’m taking an online class, Soul Restoration 2, by Brave Girls. 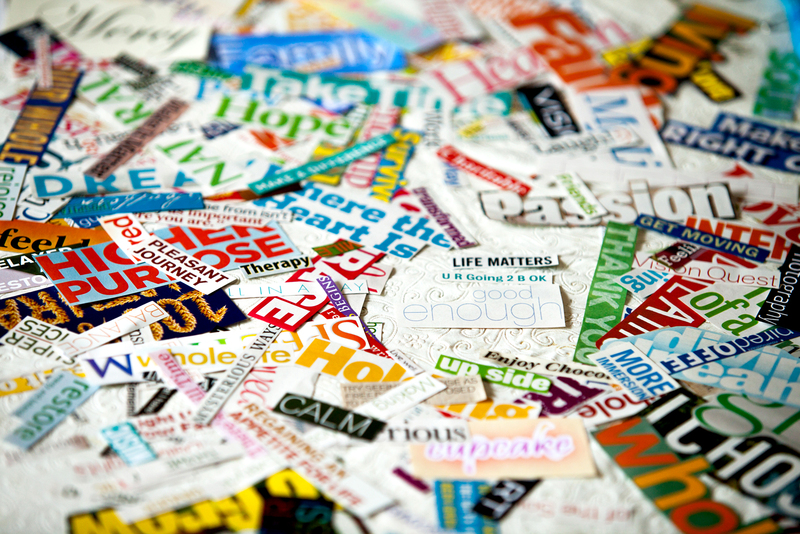 One of the projects is making a vision board using words cut from magazines. I snipped away at the pages until the table was littered with word confetti. As I cut, I got a panicky feeling that I might not find all the words that represented me. My magazine stock was very limited and I worried about finding enough words. The stack grew much bigger than the canvas could possibly hold but I kept snipping away, feeling as though my entire life needed to be fully represented or my perfection-driven soul wouldn’t feel complete. I paused, scissors in hand, and looked at the pile stretched across the table. There, in a little cleared spot, was U R Going 2 B OK. Nearby were 2 others – Life Matters and Good Enough. A huge wave of relief washed over me. It was OK! It is OK to be someone that people don’t understand. It is OK to have big ideas and not be able to put them into words. It is OK to try to do your best and still stop right in the middle to smell roses. I have this photo as my desktop today. Please feel free to save the image for your own use. U R Going 2 B OK. Word Confetti. Please click photo to see the larger image.